I am getting so fat. Seriously, I’m not even kidding. Ever since our AC started working again I’ve been baking like a maniac. In this heat wave? Yes…and I can’t stop. Everywhere I turn there’s a farmer’s market with the most gorgeous summer fruit and all I can think about is making golden, buttery galettes! I’m the type that when something’s in season, my eyes glaze over and I buy it all. Peaches are in at the moment and my kitchen is stocked. Not only that, my freezer holds a precious batch of flaky pastry dough that I made back in May in full anticipation of this seasonal splendor. I’m not a huge fan of pies, but I adore galettes. Why? Because of their even filling to crust ratio. Galettes or ‘free-form’ tarts are made without using a tart shell. They claim to be simple and rustic, but at first I just didn’t get it. How do they fold the sides like that? Why is my filling running all over the place? Why doesn’t mine look like the picture? If you’re a baker or a pie enthusiast, I’m sure that you have an opinion about pastry dough. All butter? Shortening? A combination of the two? I prefer an all-butter crust for its superior flavor. But these days I throw in a little shortening for flakiness. Leaving the butter in large chunks will also give you a flaky crust, however a little bit of both suits my taste. See those big white spots of butter? That’s what you want. First and foremost, you have to work with cold dough. That is the only way. Soft, overworked dough is too difficult to fold and will usually result in a tough crust (and a few foul-mouthed words). The second thing is to create a 2-3 inch border so that you can actually pull up the the sides over the fruit. If your border is too narrow, you won’t get the full effect. If at anytime your dough starts to tear while folding, gently press it back together. If it starts to soften up, just pop it back in the fridge (make space ahead of time!) Remember, cold is key. As far as the filling goes, galettes can be made with any kind of fruit. Keep in mind that all fruits have different moisture contents. 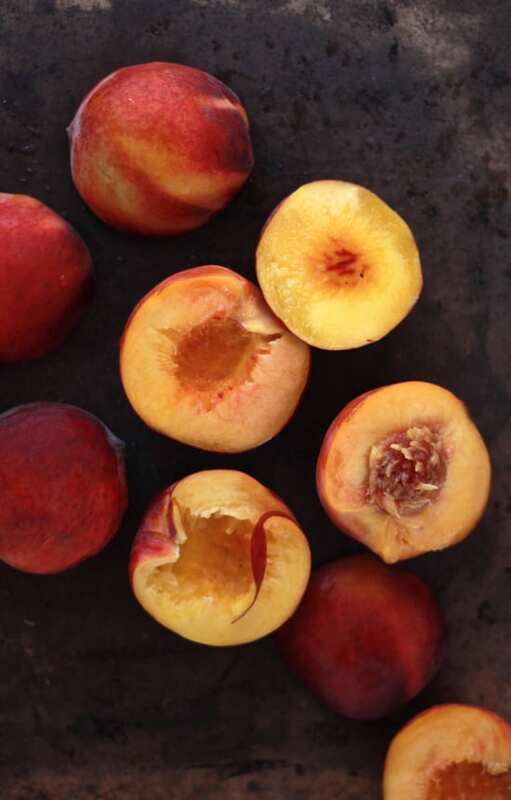 Peaches hold up pretty well, while berries do not. Cornstarch will help to thicken up any running juices. And if a little spills over, it’s totally ok. You’re going for that ‘rustic’ look. On that note, don’t worry about making your galette look like the pictures- each one should be unique and different, like you! After all, they are homemade. *To get ahead, I always make my dough in advance. You can either refrigerate it (up to 3 days) or freeze it. 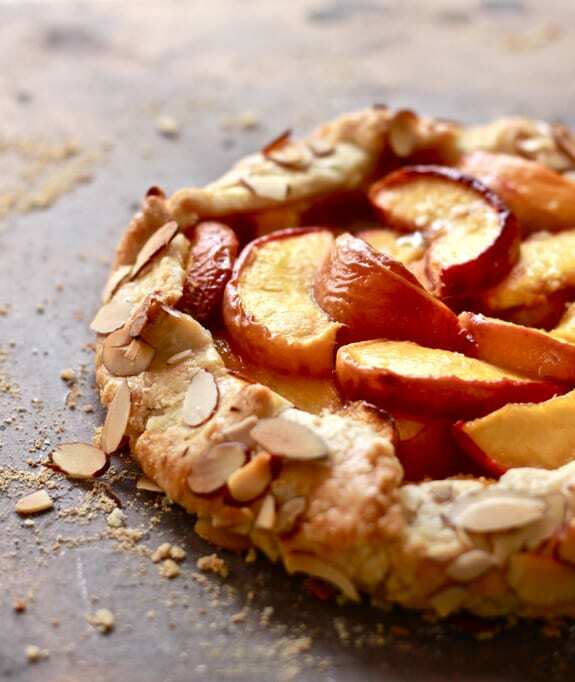 This way you can whip up a galette whenever the mood strikes. *For best results, bake your galette on a pizza stone. The bottom crust will be perfectly crisp. Make the dough- In a food processor, add the flour, cold butter & shortening, sugar, and salt. Pulse 5-8 times until the butter is the size of peas. Slowly add the ice water (1 tbsp. at a time) and pulse the machine until the dough just comes together. You will use anywhere between 3-5 tbsp. of water depending on your dough. It's appearance should look crumbly, not like a ball. When you pinch some between your fingers and it sticks together, it's done. 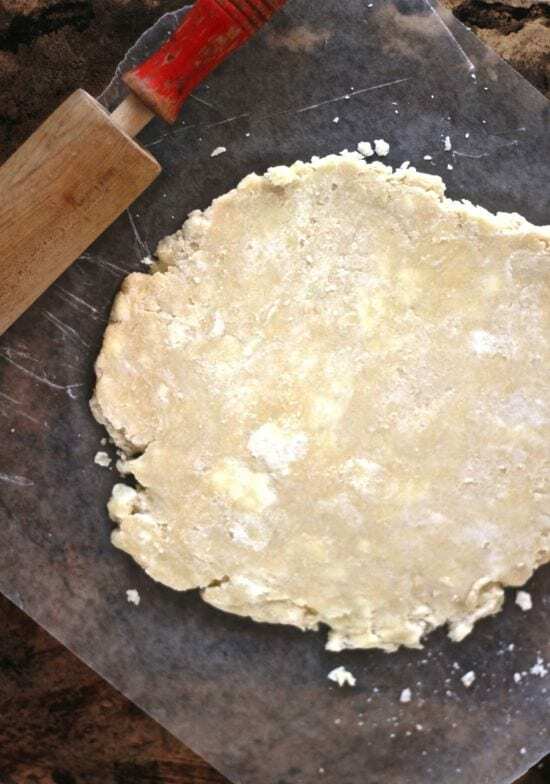 Dump the dough out onto a work surface and gently shape into a flat disk. If it seems too crumbly don't worry; it will come together as it rests in the fridge. Cut the dough in half and wrap in plastic wrap. Chill for at least an hour - overnight. Make the filling- Run your knife around the peaches and twist open to reveal the pit. Cut each half into about (6) ½ inch slices. When your dough is nicely chilled, roll out 1 disk into a 12 inch circle (save the other disk for a future galette). Do this between 2 sheets of floured parchment paper so that it does not stick. Don't worry if it's not a perfect circle; you can trim the edges with a pairing knife or just leave it as is. Transfer the dough to the fridge to chill, leaving it on on the parchment paper. Let it rest for 15 minutes or until firm. Place your peaches in the center and fold up the sides, gently tucking them in between the peaches. *See note. *If at anytime your dough starts to tear while folding, gently press it back together. If it starts to soften up, just pop it back in the fridge. Remember, cold is key. Beautiful! Altogether enticing, it is, even in this heat. And I’m with you on all points! Thanks Adri! I wish I could stay away from my oven in the summer… sometimes I’m just too tempted (I’d rather bake than cook dinner…ha ha…)I just love the variety of summer fruit. Nothing beats it! Beautiful galette and gorgeous photos Emilie! So glad your AC is back! Oh, me too Maria! I don’t know how we survived without it…especially with the little ones :) Now we have it on full blast. I’ll take hot summers over winter any day! I am sooo going to make this! And I am soooo going to make a few batchs of dough to put in the freezer – love this – thanks! Like you I’ve been baking like crazy. Only difference, they don’t have ac’s in Holland and we are having an unusually warm few weeks. Result: a few foul mouthed words that come my way! But who cares right?! Thank you Rakhee!! I wish I could make summer last forever… you’re so sweet! I can’t believe that you don’t have AC’s over there… maybe I should quit complaining, right? Ah well, once a baker always a baker! Heehee, love your brutally candid intro – it made me smile :o). But it’s so true, we are surrounded by gorgeousness this time of year and it’s so hard to resist all the delicious possibilities that swirl around in our minds! I have to say that I have been craving galette so I’m quite pleased you acted on my fantasy before I had to ;-). 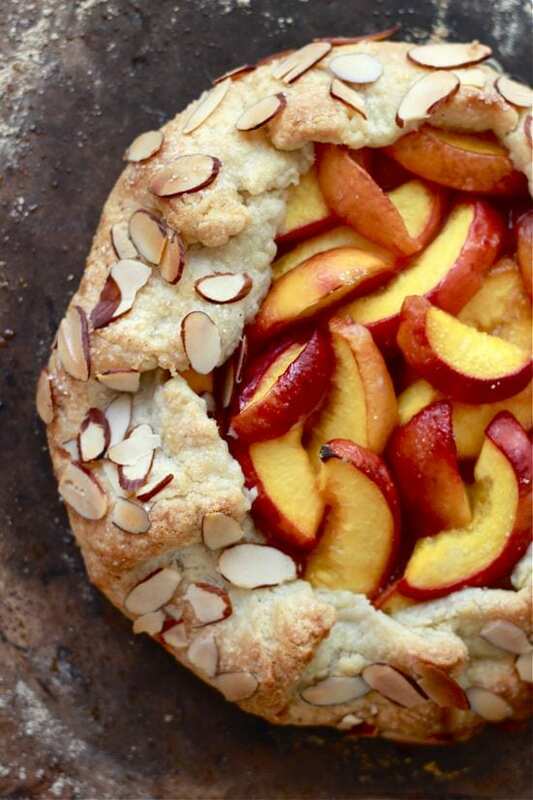 The peaches look extraordinary and I love that you added sliced almond to the crust – what a perfect touch – looks so pretty too. Lovely photography Emilie (did you use the back of a cookie sheet? looks dynamite) xo. Hi Kelly! I know…I kind of just blurted that one out, right? But I can’t help it! It is so hard to resist the simplicity of a buttery, flaky crust & sweet juicy fruit. I love desserts like that. Not to mention, the produce at this time of year is just beautiful. And I love when you’re craving a certain thing and the recipe just pops out right in front you you- I hope you like this one. Oh my, this is so gorgeous!! I can’t wait for peaches :D And I guess the one good thing of not having AC is that I can’t bake all the time(which means I’m eating yummy baked goodies all the time too, haha). Welcome Heidi! Aren’t sweet, juicy peaches the best?! You’re too funny- I hope you’re finding a way to stay cool. Thanks for stopping by! …which means I’m not* eating yummy baked goodies all the time. Lol. Whoops! Perfect timing!! We just moved into a small town and this past Tuesday morning I just happened to see a peach truck so I bought a basket of peaches. They were the best peaches I have ever had. Needless to say, those are gone but the peach truck will be back next Tuesday and I will be there to buy 2 baskets of peaches. Guess what I’ll be doing after church on Sunday? Making crust! Thanks for sharing this! 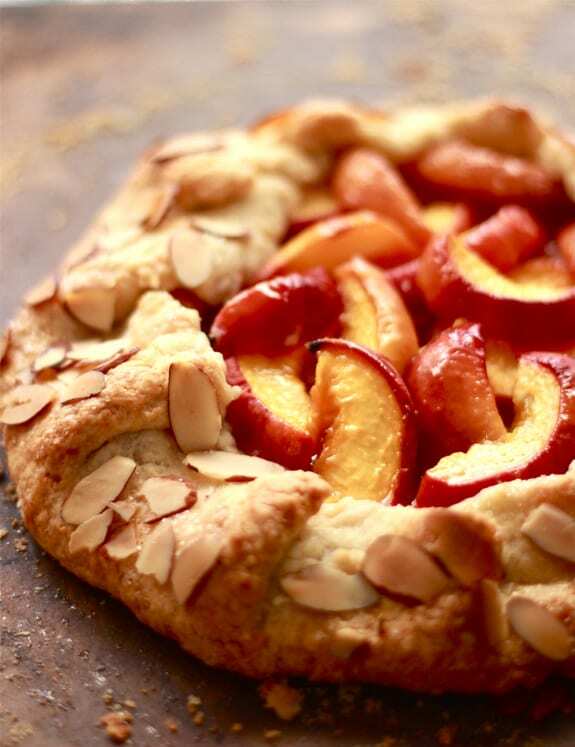 I love peaches, this is such a pretty galette! 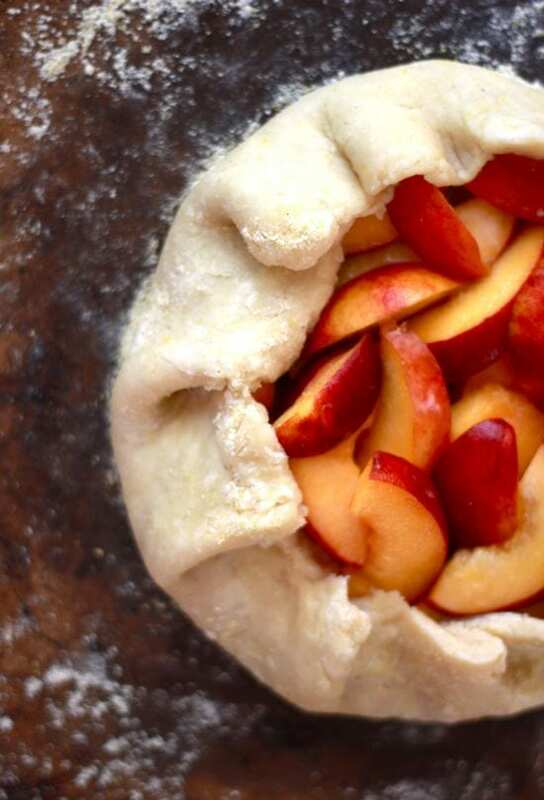 Now why have I never made a peach galette??? 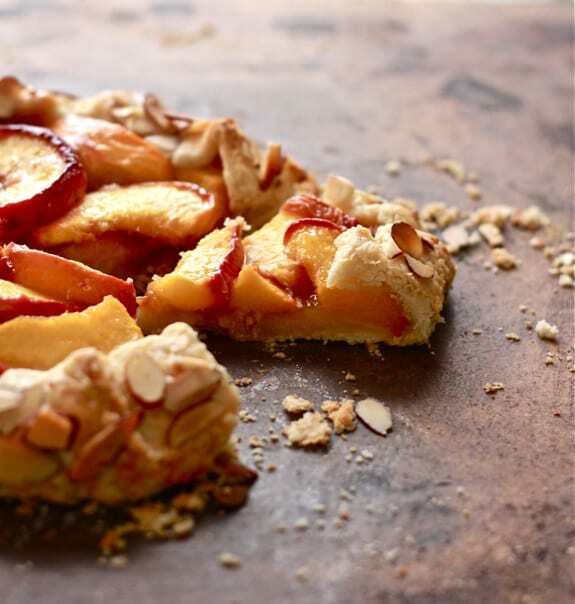 I agree about the fruit to crust ratio…and rustic is my style when it comes to pastry. Yours is gorgeous! G’day and beautiful galette Emilie, true! LOVE you photo and wish could have some right now too! that looks sooooo good and different makes me wanna try ! I’m baking this glorious looking dessert tomorrow with my daughter. I’v been looking at your beautiful pictures and noticed your peaches looked a lot less fuzzier than mine. They looked a lot like nectarines we get here in England and I was wondering if you could use them as well as the peaches for this. Just found your blog looking for this particular type of recipe and am so glad I did!